Cotton dresses are such a great thing to have on hand during the summer, especially if you live someone where that likes to stay above a hundred degrees. 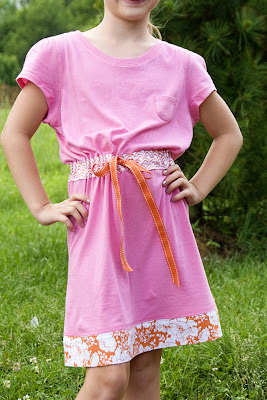 And since cotton t-shirts can be found pretty inexpensively at stores like Walmart and Target, Melissa figured out how to turn a couple of them into a cute summer dress for her daughter. This would be a fun project for your pre teen girls to knock out on their own too. You can get the tutorial over at The Polka Dot Chair.